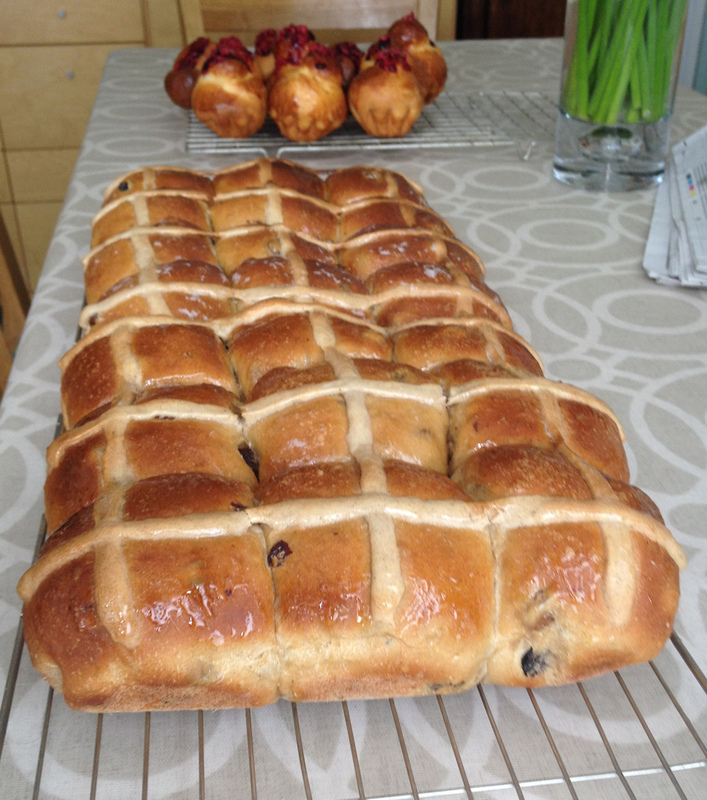 After baking HCBs from five different recipes this Easter, my now-bloated tasters and I agree these were the best. These are the buns I’ll be selling next year. I’ve tried traditional, experimental, and sourdough. The last was not a great idea; sourdough does not go well with HCB spices. It’s not a flavour match, in my opinion. The ale and tea both add pleasing depth to the flavours. He’s done a great job developing this. I’ve amended it a little to account for slightly sweeter tastes. Which was a surprise because I do not have a sweet tooth. But I guess DL has even less of one than me. I’ve also used a tastier and thicker crossing paste. I just prefer raised crosses. Probably because that’s what I grew up with. And I’ve upped the spices a little. Now all I’ve got to do is find a micro-brewery who will do me a deal on a stout. PREFERMENT: The night before, mix the stout, spices, yeast and 325g of flour in a deep bowl. Cover and leave on worktop overnight (or twelve hours if you’re starting early). Put the raisins, peel, and tea in another bowl. Cover and leave on worktop. MIX: Next day, combine the egg and butter with the fruit and tea. Stir this mixture into the beer and spice preferment. Mix in 550g flour, the sugar and salt, and leave for 10 minutes. BULK FERMENT: Lightly oil your hands and a 30cm patch of worktop. Knead the dough for 10 seconds (or S+F – see Note 4 below), leave for 10 minutes, then repeat twice more at 10-minute intervals, then leave for an hour. This is a total of 90 minutes fermentation. SHAPE: Divide the dough into 20 x 85g pieces, shape into balls (using as little extra flour as possible) and place, touching, on a tray lined with nonstick paper. I rotate each ball so as little fruit as possible is exposed on the upper surface and won’t be burnt by the oven. PROVE: Cover and leave to rise for no more than 90 minutes. The exact length depends upon room and dough temperature, so use the finger-poke test to find out when the dough is ready to bake. PIPE CROSSES: When you think the dough is almost proved, mix the paste, and pipe crosses on each ball of dough (see Note 5). BAKE: Bake at 200℃ / 400F (180℃ / 350F – fan) for up to 25 minutes. Turn onto a rack to cool immediately but do not break apart. GLAZE: Mix a tablespoon each of caster sugar and boiling water. simmer for 5 minutes until it thickens slightly then brush over the buns whilst still hot. 5′ mix preferment & fruit / 12 hours or overnight / 5′ mix dough / 3 x10′ knead & rest / 60′ bulk rise / 10′ shaping / Up to 90′ final proving / 5′ piping dough / 25′ bake. NOTE 1: If you’re using American cinnamon, increase the quantity by half. It’s a different variety (species?) to that used elsewhere and is not as strong. It’s a lesson I learnt in reverse. Took me a while to research the reason why North American cinnamon recipes were overpowering when baked in the UK. NOTE 2: Because of the high sugar content, I used an osmotolerant yeast (SAF Instant) and cut the amount to 1½ tsp. NOTE 3: I used Earl Grey tea, but the bergamot aroma was lost in amongst all the malt and spices flavours. Not a success. NOTE 4: Dan Lepard uses an interesting knead and rest cycle. However, I found the dough too slack to handle easily. I kept to his timings but used stretch-and-fold in the bowl instead. Worked great. NOTE 5: Be quick with the piping of the crosses. There’s no need to do each one individually. Work up and down, then across the pan. « what about this for an idea?